In what amounts to a big “F You” to Christianity and the citizens of Germany, a radical Muslim drove a truck into a crowd of Christians. If Merkel had a Muslim son? There is good news, however. Obama has one more opportunity to remind Americans and citizens of the world about peaceful Islam. And let’s not forget that we shouldn’t hold what one person does against an entire group of people. “I heard a big noise and then I moved on the Christmas market and saw much chaos…many injured people,” Jan Hollitzer, deputy editor in chief of Berliner Morgenpost, told CNN. Do I really need to remind you of how multiculturalism has changed the culture of Germany? Or that Merkel’s policy to usher in freely radical Islamic terrorists was a lamebrain idea, shared by crooked Hillary Clinton? Here’s more on the similar attack that played out in France earlier this year. Authorities said Mohamed Lahouaiej Bouhlel drove a rented, refrigerated truck weighing about 20 tons into crowds along a roughly 2-kilometer stretch of Promenade des Anglais on Thursday night, killing 84 people — including 10 children and adolescents — and injuring 202 others. Do you think it was a coincidence that the Muslim terrorist attacker chose Bastille Day to assault his adopted country? 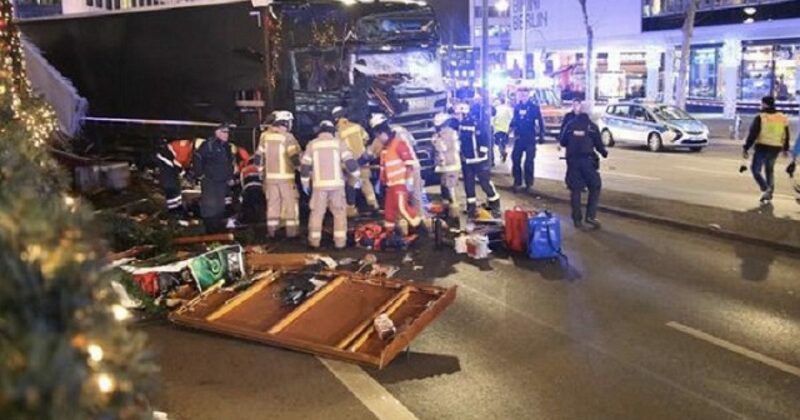 If so then it was likely just a big a coincidence that a Muslim driving a truck careened into Christmas shoppers in his adopted country of Germany. Thankfully, America has a leader who understands the problem we face. Let’s hope we can avoid becoming Germany.